After years of complaining that my kitchen-gardening efforts were thwarted by drought, I realized that the opposite scenario can be bad too. D.C.’s rainiest year ever saw much of my attempt at a fall crop go to a watery grave when lettuce, spinach and various herb seedlings couldn’t withstand repeated downpours. After the weather, the local wildlife was my biggest obstacle this year. The rabbits that scamper throughout our neighborhood may amuse our daughter, but they also found yet another way to get through the netting I’d stretched over a raised bed and devour all the lettuce and green beans in sight. To add to the indignity, one wall of that raised bed then fell apart from rot. If you only try to grow one vegetable, make it this one. 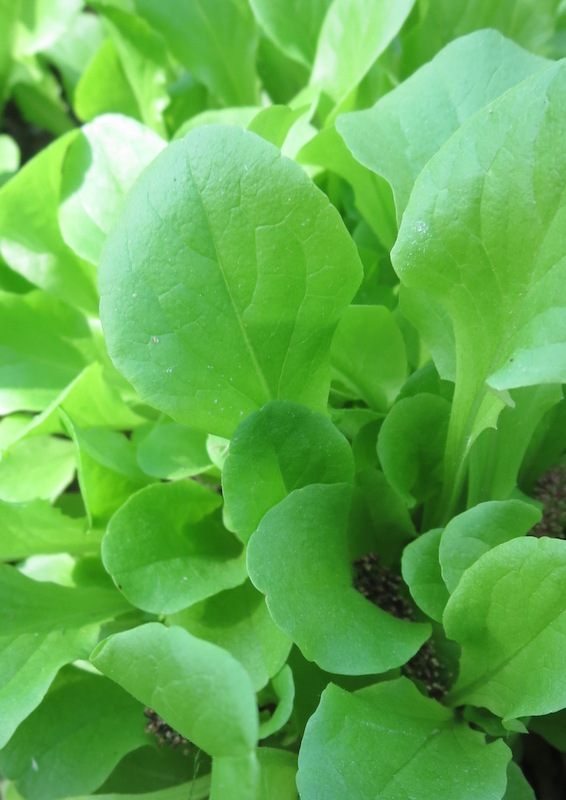 Arugula grows prolifically in the spring and fall–the photo at right dates to only last week–it’s great in a salad or on a sandwich, and unlike lettuce you can use it in risotto or an omelette. This grade is inflated by how well sage, parsley, and (after a slow start) mint did. Basil, however, was nowhere near as prolific as it was last year, and cilantro underperformed by an even larger margin. Mint, rosemary, dill and oregano did okay, while thyme had no time for me. After years of frustration, I finally got a respectable tomato crop. Lesson learned: There’s no such thing as overengineering your attempts to keep squirrels away from tomato plants. Another lesson learned: There is no tomato more delicious than the one you pluck on a summer afternoon and slice up, still warm from the sun. A solid spring was not matched by any fall crop, thanks to the aforementioned precipitation. Same problem here. Which is too bad, considering how last year’s spinach survived throughout the winter. I thought these were off to a good start, and then those rascally rabbits made short work of them all. The seeds I planted did not appear to survive contact with dirt. To be fair, I think the seeds were from last year. These, too, failed to sprout, extending my streak of futility at trying to coax a crop of these out of my garden. With last Thursday’s hard frost, another year of backyard gardening has come to an end and it’s time once again to assess the results of a hobby that may not make much financial sense on an opportunity-cost basis–but which does allow a regular analog respite from all of my screen time. Planting basil seeds in a different, sunnier spot paid off with weeks of abundant leaves that I could toss into pesto sauces. The sage did even better and has kept on going into winter, although the relative lack of recipes for it means I’ve left most of the crop outside (any ideas to change that?). The parsley, meanwhile, rebounded from its subpar 2016 showing and once again led me to make multiple batches of tabbouleh in the spring. Mint, oregano, and rosemary were their usual prolific selves, and chives and dill did well in the fall. But cilantro only showed up in trace quantities. I got a terrific spring crop of this versatile green that lasted into July, then had another several weeks’ worth in the fall. If you’re thinking of starting a kitchen garden, this should be first plant you aspire to after parsley or basil. Planting this in a sunnier spot paid off spectacularly well in the spring and summer, yielding an outstanding return on my investment in a couple of seed packets. If only I’d bought more: I couldn’t try for a fall crop because I forgot to purchase extras in the spring and then couldn’t find any after August. Last year’s plants held on through last winter–the day I got back from SXSW, one day after the season’s one notable snowfall, I brushed off some of the accumulation to pluck some leaves to use in a pasta sauce. It flourished throughout the spring but did not reward me with a fall crop. These did great through the spring, but then some of our neighborhood’s many rabbits got into the raised bed and devoured the plants. Having enjoyed the Peter Rabbit books as a toddler, I can only laugh at the thought that I’ve become Mr. McGregor. Modest, incremental improvements at cultivating tomatoes did not yield a huge difference in this gardening paradox: I have no trouble getting tomato plants to sprout, but coaxing any to bear fruit is much less of a sure thing. Just to show that there’s no year-over-year logic to gardening, a comparable level of effort this year yielded 100 percent less than last year. Fortunately, cucumbers cost almost nothing at farmers’ markets. For yet another year, I got nowhere trying to grow these. I really did think that the 2016 gardening season had ended in December with the first hard frost. But then the parsley and the spinach refused to die. Even the few inches of snow we got in March wasn’t enough to kill them, as I found out when I removed some chunks of hard-packed snow two days after I got home from SXSW to expose intact spinach leaves that promptly wound up in a creamy pasta sauce. Now that the ground has warmed up and the arugula and lettuce seeds have germinated and gone to work, I suddenly have more parsley and spinach than I know what to do with–although I’m trying by throwing some into every stir-fry, stew and sauce I can put together. I guess I’ll also be making a lot of tabbouleh and parsley-walnut pesto weeks earlier than my usual gardening schedule would suggest. Every earlier version of this annual post has come in November or December, but this time around winter forgot to start on schedule. Until a few days ago, I could still step outside and grab some cilantro, parsley, oregano or mint. With temperatures that fell into the teens yesterday and a snowstorm forecast for the weekend, that’s no longer an option. So it’s once again time to grade my attempts at growing my own food in our tiny backyard. This grade is almost entirely parsley-driven. I had so much of this stuff growing that I started making tabbouleh just to make it go away (and was then flattered to have a friend with Lebanese ancestry approve the results). Parsley-walnut pesto is another good way to deal with a surplus of that herb; it keeps forever in the fridge and is a good addition to sandwiches. I also had good results with mint, oregano, rosemary and chives, leaving basil as this year’s one notable disappointment. Once again, I had more of these than I knew what to do with, and too many rotted on the vine. I should have blanched and frozen them, right? Like last year, this did fantastic in the spring, but my attempts at a fall crop didn’t pan out. I’m blaming the crush of conferences that kept me out of town for much of September. Getting this to grow always makes me happy, because lettuce is one of the more expensive items per pound in a store. This outperformed in the spring, but nothing came of the seeds I planted in September. I got a decent yield in the spring, and then it was starting to show signs of a second crop in the fall when the weather got a little too cold for a vegetable that fragile. I finally stopped trying to grow them on the shady side of the house and instead set up a planter on the sunnier end of the back patio, but the local squirrels kept snacking on my still-green tomatoes until I finally enclosed the whole thing in netting. One last, sad, little plum tomato has now almost ripened in my kitchen. I harvested two or three, tops. But since I’d only bought one packet of seeds, that’s not an awful return on investment when you compare what buying those cukes would have cost. I assure you that I planted some seeds for them, but I cannot tell you what happened to them afterward.